It’s now time for part two of my post “Deja Vu.” These are things I found in one particularly lucrative pile in Rosemont on Thursday. I have here a collection of hats, two of which are made of fur. Unlike the other fur hats I found recently these are in really great shape and have been tell taken care of. My room-mate says I should be able to get 30-40 bucks each for the furs. 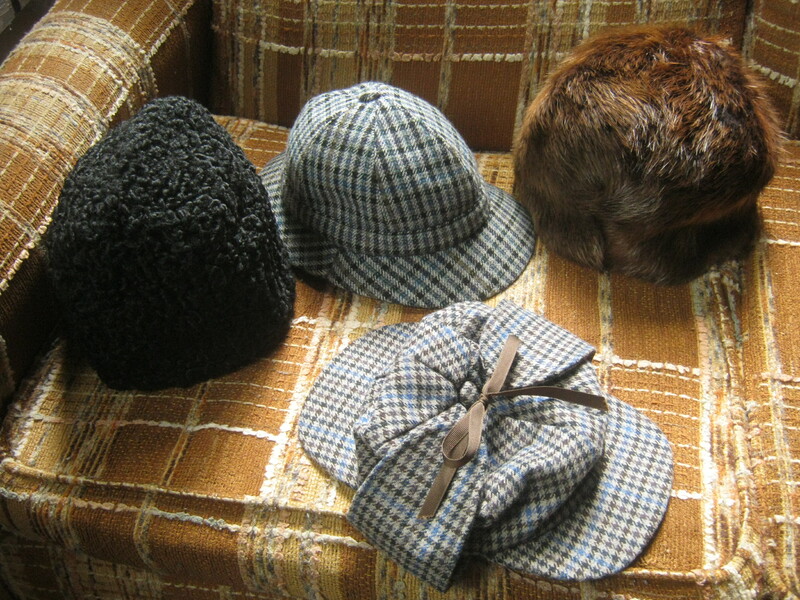 One of the hats is Sherlock Holmes-y, it’s much too small for me though. 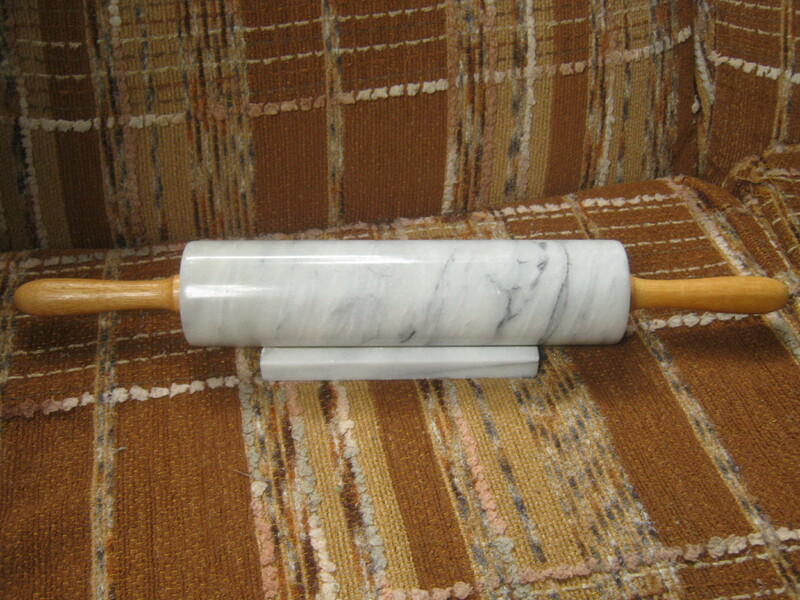 A marble rolling pin that will make an excellent addition to my kitchen! 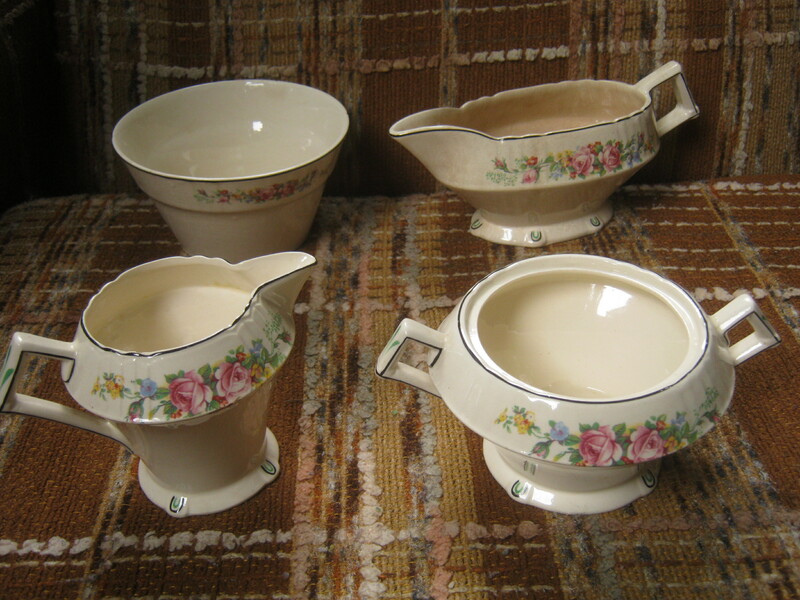 Some nice old dishes by Myott out of Staffordshire. The bowl at front right looks exactly like one I bought when I was out in Alberta (though I forgot to put the lid in the picture) which added to the deja vu-ness of the day. They’re all very nice pieces. I’m not settled enough to own nice dishes but I’ll keep the bowls to store random stuff in. 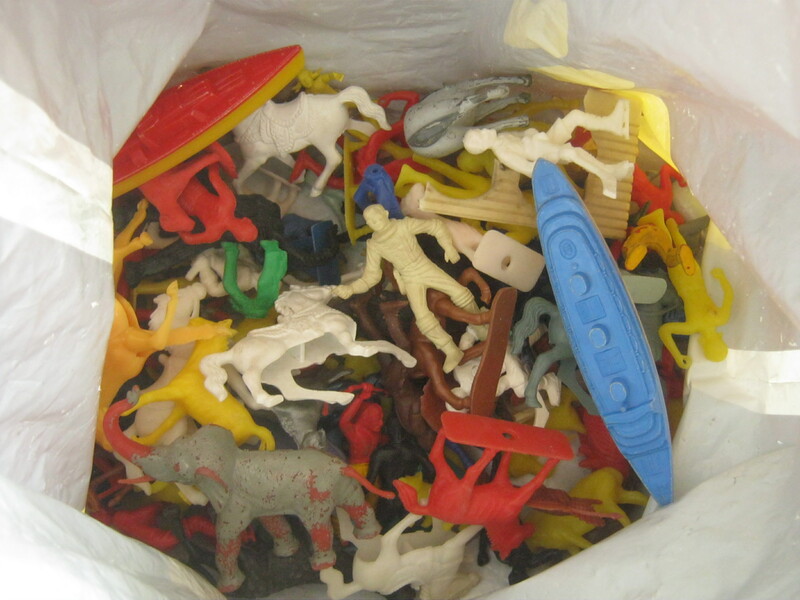 I found a bag full of old plastic toys. I don’t think there’s anything too collectible here I still thought it was worth saving. Another bag contained a bunch of sewing stuff of which these buttons were the most notable. 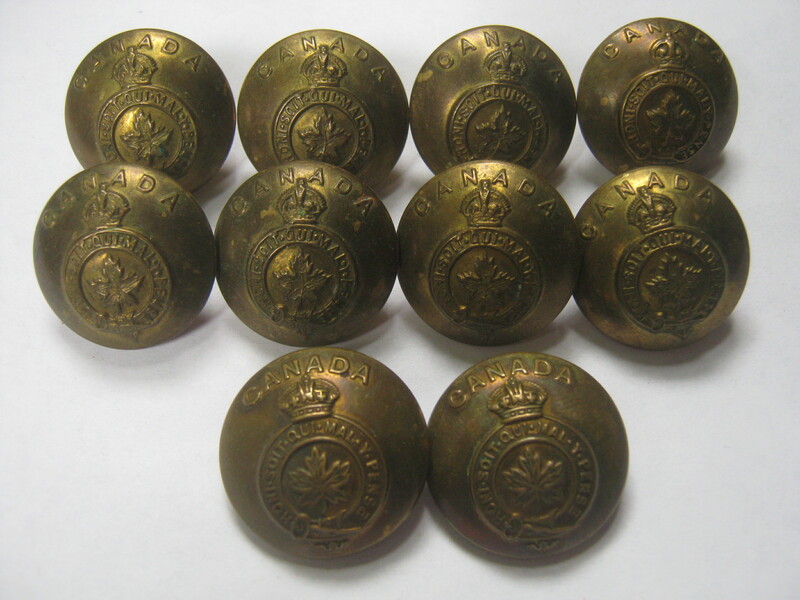 They’re made of brass and they look to have come off an old army uniform. The top eight are different (made by WM Scully in Montreal) than the bottom two (JR Gaunt and Son in London). 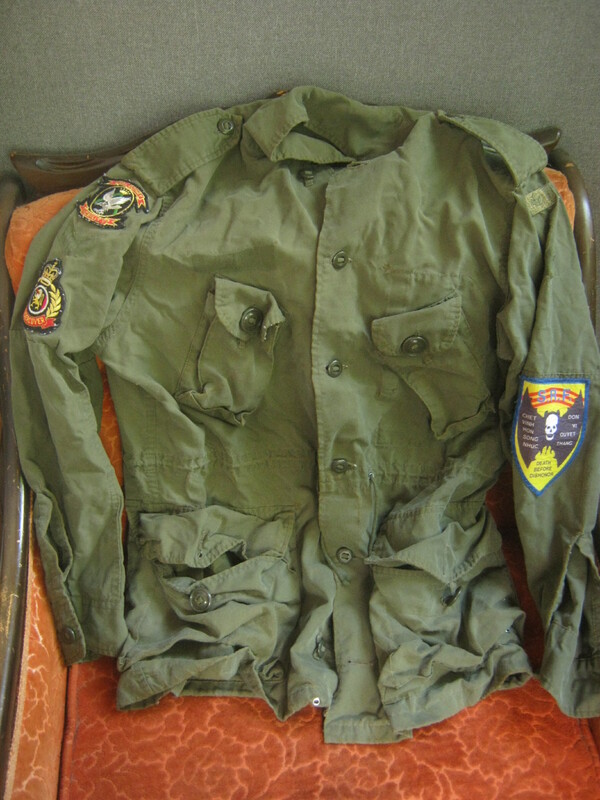 This army jacket has some interesting patches on it, including the one above which looks like it could be from Vietnam. There’s a Canadian flag on the right shoulder that seems to be part of the design, odd as Canada never fought in Vietnam. 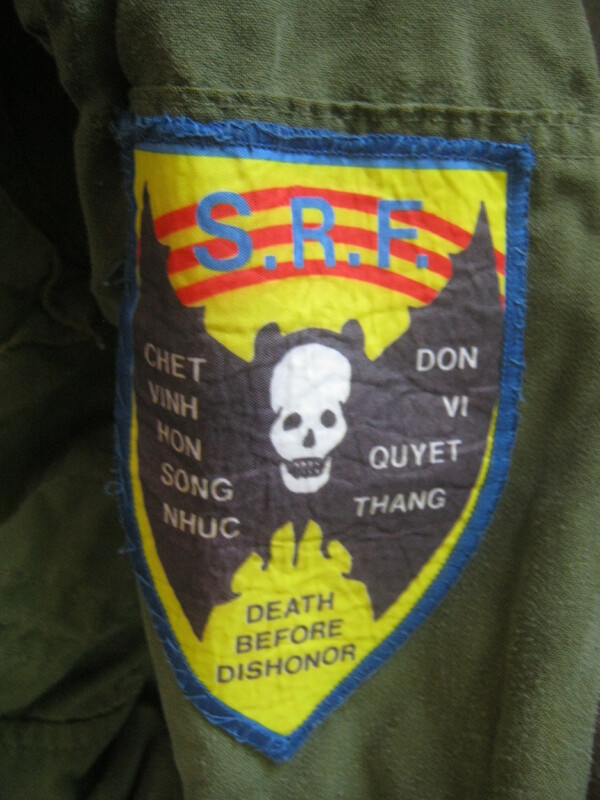 I’m thinking that this jacket was bought at an Army Surplus store and the patches added later. That’s all for now. I’m going to do my usual Rosemont trash run tomorrow morning. It looks like there’ll be rain in the afternoon (surprise surprise) but I’ll still get out there to check out the Mile End. The plastic toys remind me of the ones that my brothers and I used to play with as kids. That marble rolling pin is really nice. Dough does not stick to marble the way that it does to wood. some old buttons can be worth thousands, saw a big article. please research before you sell for a few bucks. Some great finds in Rosemont.The last three week-ends it has rained so a lot of garage sales,yard sales and outdoor sales were put off or canceled.I expect a lot of good stuff will be junked in the next few weeks before July 1,Moving Day.Please rescue as much good stuff as you can. The “Sherlock Holmes-y” one is referred to as a ‘deerstalker’ (for obvious reasons; traditionally used for hunting). The other, matching hat is in the traditional style of a pith helmet, but (I take it) without the actual helmet underneath? If so, what I would refer to as a safari hat. Very cool. I’d hang onto those buttons.Maybe check with someone at the Black Watch on Bleury to see if they would want them.They do have a little museum there.Ask for Col.Bolton. They look valuable to me. Been having a looksee for your buttons. On the back the 8 on the top have “WM Scully Ltd Montreal” and the other two have “JR Gaunt and Sons London”. wondering if the french might make a big diff to a collector, as i think someone told me, not as many french went to war. maybe you could post a larger snap of one? Maybe I’ll tack a larger shot of one to my next blog post. If the French adds value to military collectibles that would bode well for the dog tags I just found. love the marble rolling pin! !